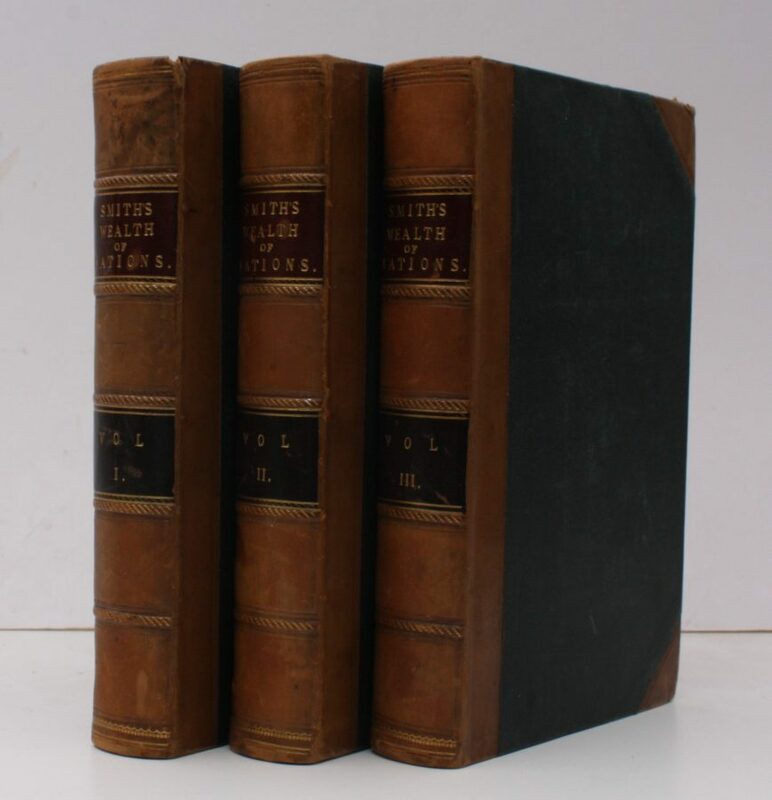 3 vols., 8vo., Sixth Edition, early nineteenth-century signature on titles, some light and inoffensive spotting to a few leaves, some very ight marginalia in pencil only; strongly and attractively bound in nineteenth century half calf, boards in dark green diced cloth, backs with five raised bands tooled in gilt, second and fourth compartments with red leather labels ruled, lettered and numbered in gilt, red sprinkled edges, a remarkably well-preserved, crisp, clean copy in later period binding. One of 2000 copies printed. 'The Wealth of Nations', coming at a point when 'natural liberty' was being being widely debated, had a decisive influence both on the study of national economy and on the freeing of economic policy from the artificial restraint of the mercantilist system. Smith's statement that labour is the source of a nation's commodities and that the variation in 'stock' values are due to the interaction of wages, profits and rent, formulated the doctrine of the classic school of economic thought, and round it all modern economic discussion has revolved' (PMM). Goldsmiths 14612; Kress B.2209; Tribe 41. See also PMM 221, 363.